Stock #PLS1036A:Platinum 2.50 Carat TW Russian Cubic Zirconia's (3/4 ct center asscher cut, 2- 1/3 ct asscher cut side stones). Gorgeous, Top Quality Rings, Russian CZs!!! Nice traditional style ring. 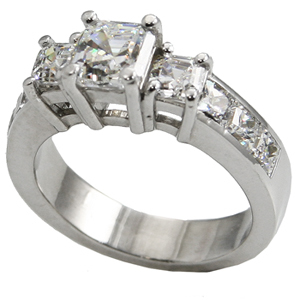 6 channel set princess cut side stones.